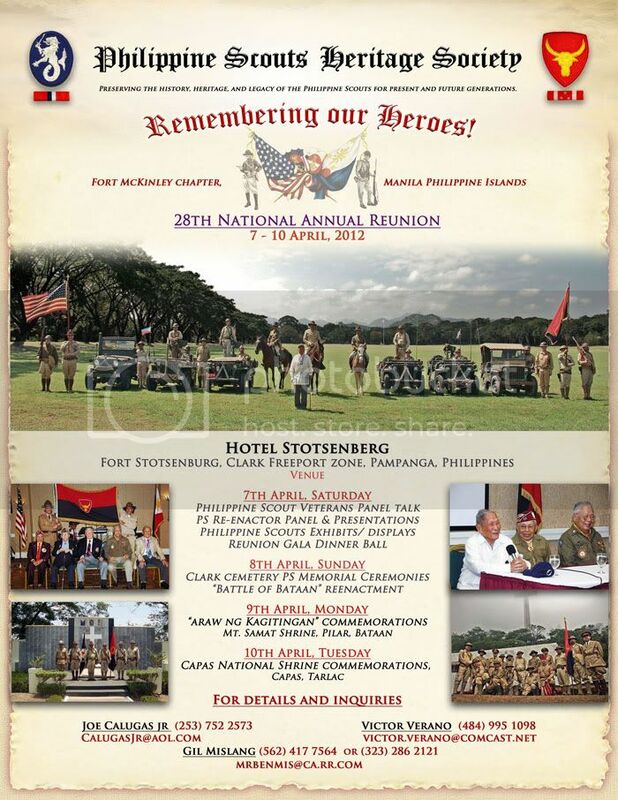 The 28th Annual Reunion of the Philippine Scouts Heritage Society took place at Ft. Stotsenburg, Clark Freeport Zone, Pampanga, the Philippines on April 7 through April 10, 2012. It coincided with the 70th Anniversary of the Fall of Bataan. This gathering was hosted by the Ft. McKinley, Manila Chapter. This is the souvenir program for the 28th Reunion. On April 8th, the Society held a plaque unveiling ceremony, a plaque that was dedicated to the 650 forgotten Philippine Scouts buried at Clark Veteran's Cemetery. The Society also remembered Medal of Honor recipient Corporal Jose Nisperos. The following video shows some of the highlights of the very first reunion of the Philippine Scouts on their home soil, courtesy of Philip Garcia. It is important to note that, at the time of the posting of this video on our site, one year had elapsed since the reunion. Within that time, two of the Philippine Scouts featured in the short film were called by their Commander-in-Chief: Captains Eulalio Arzaga and Felipe Fernandez. May they rest in peace and may their legacies last forever. Click here for photos and more from the 28th PSHS Reunion. As our late founding President, General Royal Reynolds would say, Mabuhay ang Philippine Scouts!